The purpose of the Organization theme is to define and establish the project's structure of accountability and responsibilities. PRINCE2 is based on a customer/supplier environment. It assumes that there will be a customer who will specify the desired result and probably pay for the project, and a supplier who will provide the resources and skills to deliver that result. One of the principles of PRINCE2 is that all projects must have a defined organizational structure to unite the various parties in the common aims of the project and to enable effective project governance and decision making. PRINCE2 defines a project as "a temporary organization that is created for the purpose of delivering one or more business products according to an agreed Business Case". 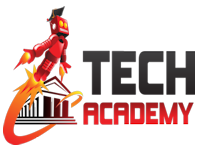 It needs to be flexible and is likely to require a broad base of skills for a comparatively short period of time. The PRINCE2 principle of defined roles and responsibilities states that a PRINCE2 project will always have three primary categories of stakeholder, and the interests of all three must be satisfied if the project is to be successful. 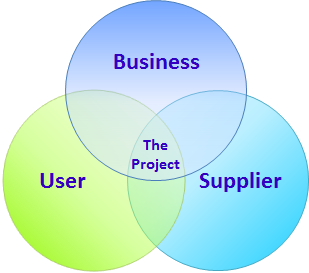 Supplier The creation of the project’s outputs will need resources with certain skills. The supplier viewpoint should represent those who will provide the necessary skills and produce the project product. The project may need to use both in-house and external supplier teams to construct the project product. The Senior Supplier(s) will represent this stakeholder interest on the Project Board. Since senior management may not be available on a day to day basis to make decisions, PRINCE2 separates the direction and management of the project from the delivery of the project's outputs, by using the principle of Management by Exception. A project management team is a temporary structure specifically designed to manage the project through to its successful delivery. Monitoring that the solution will meet the needs within the constraints of the Business Case in terms of quality, functionality and ease of use. 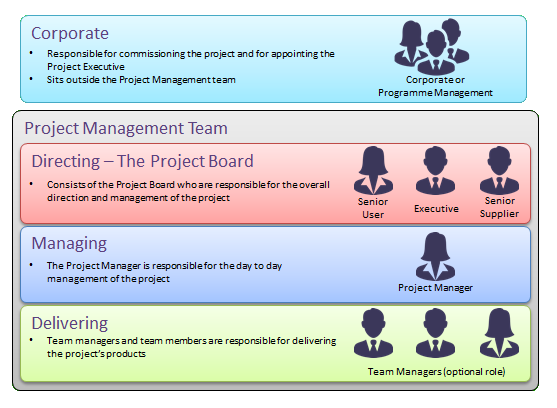 Producing a matrix of stakeholders against the project's products also helps split the project stakeholders (who need to be engaged as part of the Communication Management Strategy) from the project decision makers (who need to be on the Project Board). In projects with no separate individual allocated to a Team Manager role, the Project Manager will be responsible for managing work directly with the team members involved. 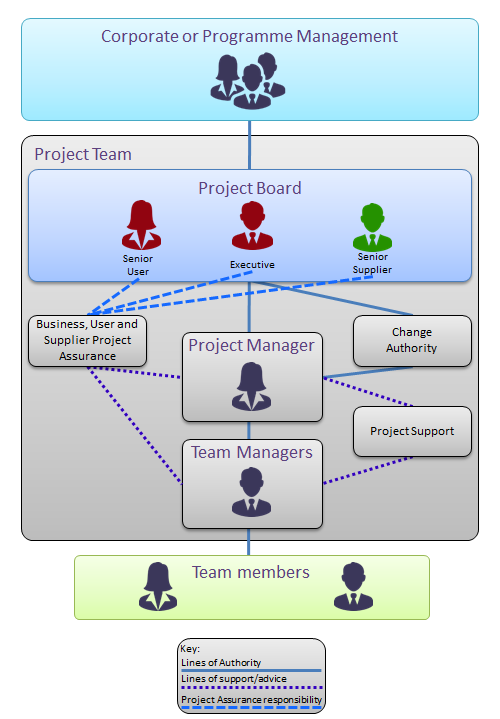 In projects with no separate Project Support role, the support tasks also fall to the Project Manager, although they may be shared with team members. 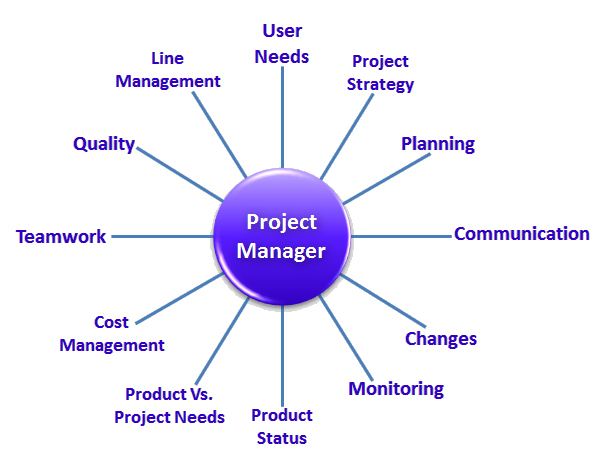 As the single focus for the day-to-day management of a project, there are many different aspects to the Project Manager role! Project Support and Project Assurance roles should be kept separate in order to maintain the independence of Project Assurance. It is therefore important to analyse who these stakeholders are and to engage with them appropriately. Stakeholder engagement, is the process of identifying and communicating with those who have an interest or influence on the project's outcome. Measuring effectiveness (Results) Checking the effectiveness of the engagements. 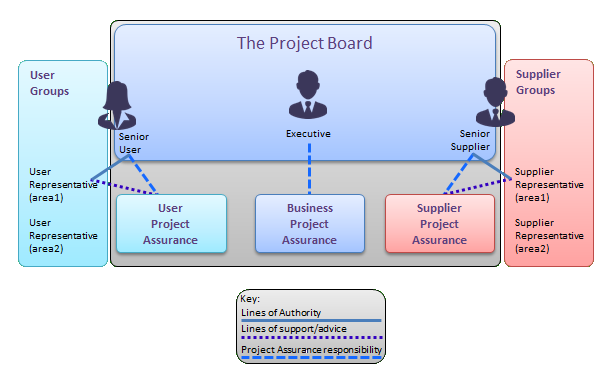 Project Assurance could be involved in checking all the key stakeholders, their information needs and that the most appropriate communication channels are covered. The Communications Management strategy contains a description of the means and frequency of communication to all (internal and external) parties involved with the project and facilitates engagement with stakeholders through the establishment of a controlled and bi-directional flow of information. The Project Manager is responsible for creating the Communication Management Strategy, which should also be reviewed and updated (if necessary) at each stage boundary to ensure it includes all the key stakeholders.